Last month, Skyword’s clients, including The Wall Street Journal, IBM, Everyday Health, and Education.com, used our content production platform to produce more than 13,000 pieces of original content for their Web and social properties. As a growing list of media companies, brands, and retailers adopt Skyword to manage their digital content production, we gain insight into the world of content marketing and publishing. We write each month to share best practices that we observe industry-wide. In our most recent Skyword study, we analyzed data regarding an article’s time of publication to determine how time of day affected news consumption. We studied 42,088 articles published on our own news property, Gather.com, across a variety of news categories (general news, politics, sports, celebs, entertainment, business, technology). 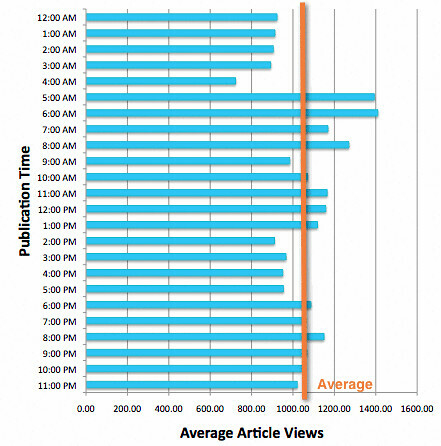 Gather articles are published on a full 24-hour cycle, and we analyzed data obtained over the last 8 months. Since most news articles have a short shelf life, we only counted the views achieved within the first 30 days of publication. Decades ago, radio broadcasters learned the importance of the drive-time window. For digital news publishers, the key windows for publishing are just prior to breakfast and lunch. Dinnertime saw a small bump in traffic/article but did not benefit from the significant surges that the earlier breaks did.